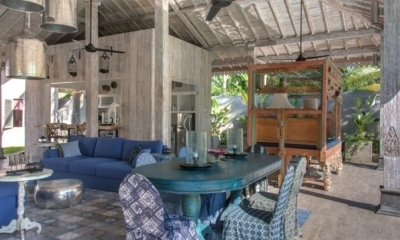 Villa Coral Flora is a beautiful bohemian beach house located just steps from the beach. The magnificent architectural setting of Coral Flora Villa cannot take away anything from the stunning view this awe-inspiring vacation spot commands. 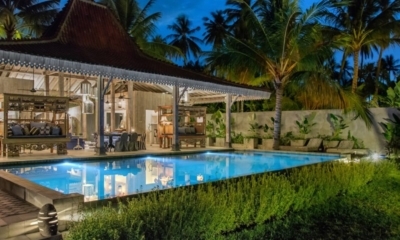 This four bedroom Gili Trawangan villa is pleasure to behold, statuesque, bold and supremely detailed in its design be it the Indonesian fresco on the first floor or the carved wooden headboards, or the rusticity of the bamboo bar. 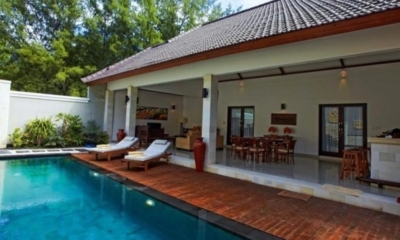 The villa has four bedroom thus accommodating eight guest, two of the bedrooms with a spectacular view of the ocean are on top while two are on the ground floor. Each come with their ensuite bathroom that are fitted with local style stone showers, some even open to the sky! The ocean front- perhaps the most picturesque on Gili Trawangan is yours for free, in fact in the ground floor pavilion you could have breakfast in the open air lunge, stroll barefoot out on to the beach and take a bicycle ride down to the village before you return to the air-conditioned comfort of your bedroom. The fresh colors in the rooms, the soft natural fiber linen and the gorgeous use of natural wood from the island, some even recycled with a large amount of bamboo handcrafted pieces are simply enchanting in their comfort and great looks. Go snorkeling , scuba diving or simply take a walk down to the trendiest of café in the area-return to soak in some more of Coral Flora’s hospitality-utilize the kitchen with its range if equipment and cook up a surprise meal for the family-you’ll find plenty of inspiration in a place as relaxing and homely as this. Read More About Gili Islands. 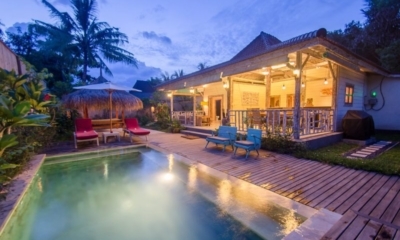 About Villas in Gili Islands. Adventures in Bali start in your Kokomo Resort with excellent inclusions. Make your next holiday just perfect. Adventures in Bali start in your Scallywags Joglo with excellent inclusions. Make your next holiday just perfect. Adventures in Bali start in your Villa Sama Lama with excellent inclusions. Make your next holiday just perfect. Adventures in Bali start in your Joglo House Lombok with excellent inclusions. Make your next holiday just perfect.